A couple have exchanged their wedding vows 1,000ft (305m) above the Gloucestershire countryside. The ceremony, delayed due to bad weather, took place on three planes. Groom Darren McWalters, 24, stood on the top wing of a biplane, while his bride, Katie Hodgson, 23, stood on the wing of another plane. The vicar flew ahead on a third aircraft while guests of the couple, from Lancashire, heard their vows exchanged over speakers at an airfield. 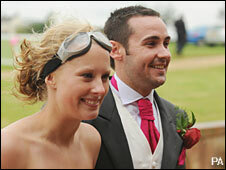 Jets of white smoke fired from the backs of the planes as the couple, from Leyland, exchanged their vows in mid-air. Fitness instructor Mr McWalters said: "We got engaged in the Brazilian rain forest and I wanted a wedding blessing that would top my proposal. "It was unbelievable. Looking down and seeing my family and friends below was just incredible. I'm lost for words." Ms Hodgson, a postwoman, said when she was a young girl she never imagined she would wed on the wings of a plane. She said: "As I got older I became more adventurous. I bring the adventurous side out of Darren - he used to be scared of heights." The couple were married by Rev George Bringham, 67, who works around Shipley, near Bradford. He said he was not scared in the slightest by the experience. "I did this before, about eight years ago," he said. "It's certainly the most unusual wedding I've ever done. "The only hairy moment was when I thought my goggles were about to come off." Heavy winds and rain cut the flight short and the couple were rushed inside. The couple exchanged rings inside the reception hall at the airbase before sitting down for a private dinner and party. Earlier on Tuesday heavy rain and low cloud had meant delayed the ceremony as it was not safe for the planes to take off from the airfield at Rendcombe, near Cirencester.